Last week I published a study demonstrating what happens to the stock market when the Russell 2000 (small caps) index goes up 6 weeks in a row. The Russell has extended that streak to 7 weeks in a row. Here’s what happens next to the S&P 500 when the Russell 2000 goes up 7 weeks in a row (for the first time in half a year). Notice how the U.S. stock market’s medium-long term returns are EXTREMELY BULLISH. The S&P goes every single time on a 6 month and 1 year forward basis. The median return in 1 year is 15.5%! 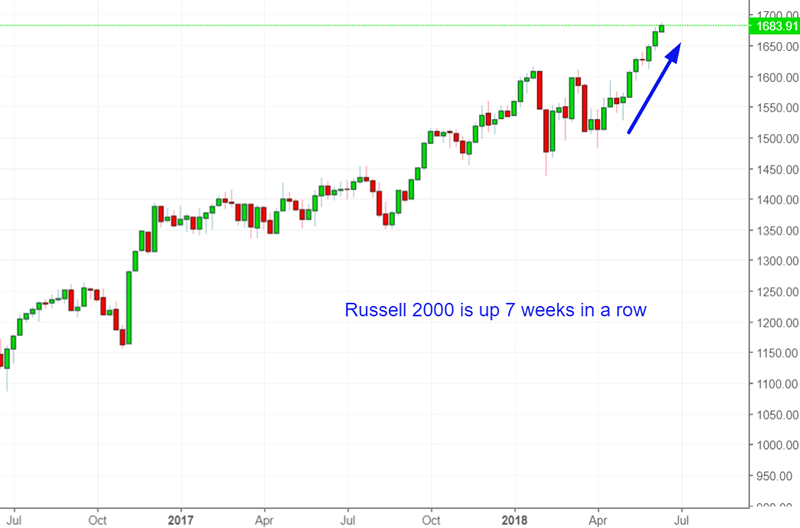 The stock market surged after the Russell 2000 went up 7 weeks in a row. The stock market (S&P 500) rallied another 9 months after the Russell went up 7 weeks in a row. The stock market soared after each time the Russell went up 7 weeks in a row. The S&P 500 rallied another 1.5 years before starting a “significant correction” (which the Medium-Long Term Model predicted). This study suggests that the stock market has a very high probability of going higher over the next 6 months and 1 year. The Russell going up 7 weeks in a row is a sign of extreme strength. Extreme strength only happens during bull markets – it doesn’t happen during bear markets (i.e. this isn’t a bear market rally).